Allnigeriasoccer.com can exclusively report that promising Nigerian youngster Daniel Obi has agreed a two-year deal with English Premier League side Leicester City following a successful trial. The central defender has moved a step closer to becoming a professional footballer after penning a scholarship deal with The Foxes on Thursday, November 29. Obi's agreement with Leicester City will be activated on July 1, 2019 ahead of the start of pre-season preparations and this is subject to the player successfully completing the club's medical. Leicester City have started offering their outstanding players scholarship deals now because they have to send decisions of who they are giving new contracts to the English Football Association by March 2019, so clubs have to sort themselves early. The former Premier League champions have in their ranks Super Eagles stars Kelechi Iheanacho and Wilfred Ndidi, and Obi hopes to follow in their footsteps by playing for the first team. 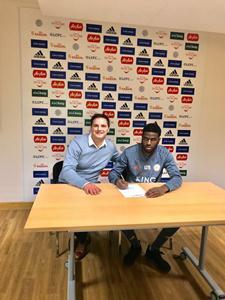 Layton Ndukwu, Calvin Ughelumba and U17 World Cup winning midfielder Habib Makanjuola are also on the books of the King Power Stadium outfit.